Click on a thumbnail graphic below to view a gallery of drought information from the US Drought Monitor. US Drought Monitor December 18, 2018. West Drought Monitor December 18, 2018. Colorado Drought Monitor December 18, 2018. Widespread moderate to heavy precipitation from this week’s storm system occurred from central Oklahoma eastward through Arkansas into Tennessee and northern Mississippi. Western north Texas, east Texas, and Louisiana also received moderate to heavy precipitation, while the dry slot of the storm system kept precipitation amounts minimal from central Texas to the Dallas-Fort Worth area. Generally warm conditions prevailed from the Texas Panhandle eastward through Tennessee this week, while more moderate temperatures and a few areas of below-normal readings were common in southern Texas, Louisiana, and Mississippi. With continuing dry conditions on short and long timescales, abnormal dryness expanded from the Amarillo area to cover more of the Texas Panhandle. 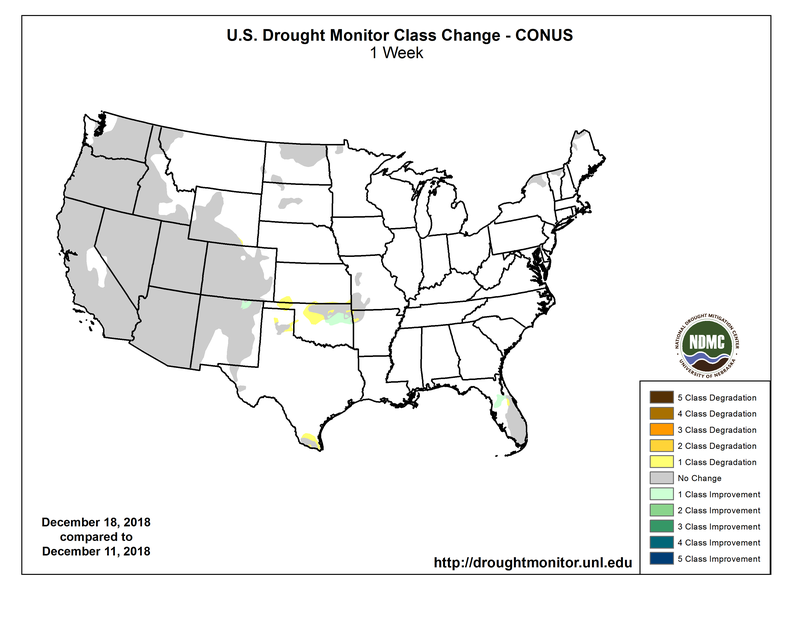 Continued dryness in the 1- to 2-month timeframe in western Oklahoma and the Texas and Oklahoma panhandles, combined with very high winds associated with this week’s strong storm system increasing evaporative stress, led to the introduction and expansion of abnormal dryness over parts of western Oklahoma and the panhandles. The short-term dryness and depleted soil moisture here is beginning to apply stress to wheat, and fires are starting to become a concern in the region too. Adjustments to moderate drought and abnormal dryness were made in central and northeastern Oklahoma in response to where the heavy rain fell and where it missed this week. Areas that missed out on the heavier rains saw status quo or degradations as short- and long-term precipitation deficits increased, while deficits decreased and conditions improved in areas that received more rainfall. Short-term dryness also continued in the Lower Rio Grande Valley, where abnormal dryness expanded. For the rest of this week, the National Weather Service Weather Prediction Center is forecasting widespread moderate to heavy precipitation, with the highest amounts generally confined to an area ranging from eastern Texas northeast to the Atlantic Coast. Moderate to heavy precipitation is also forecast in the Pacific Northwest. Primarily warmer than normal temperatures are also expected in the Lower 48 this week. US Drought Monitor one week change map through December 18, 2018.